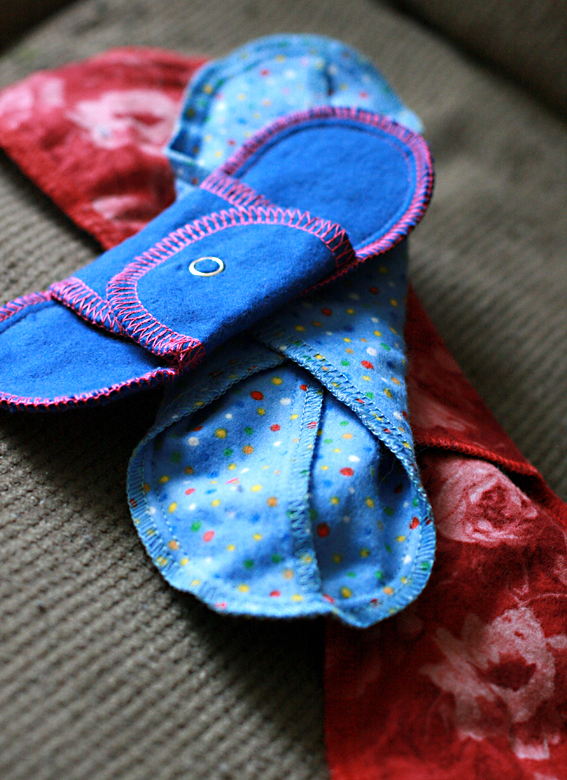 Knickernappies and Fluff Envy are offering my readers a giveaway of a Stackable Menstrual Pad Set! This Knickernappies cloth pad set is made of a waterproof fleece shell with two absorbent microfiber and velour liners, and is a reusable, eco-friendly solution to your period. Knickernappies sent me the same microfiber set plus two extra pad liners for review. I had been using a reusable menstrual cup but with disposable pads and pantyliners as backup, and I was eager to try out greener cloth options. 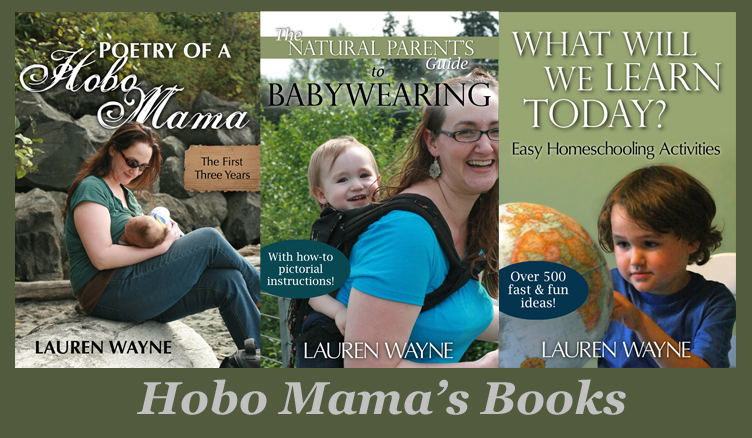 I love the idea of the Stackable Mama Pads. They're a unique 3-in-1 system that will fit absorbency needs from pantiliner to regular pad to heavy flow. That way, you can adjust the absorbency throughout your menstrual cycle without having to buy several different pad sizes. The shells and liners are consistently the same sizes so any future shells or liners you buy will fit any other set. The outer shell is very thin, waterproof fleece. 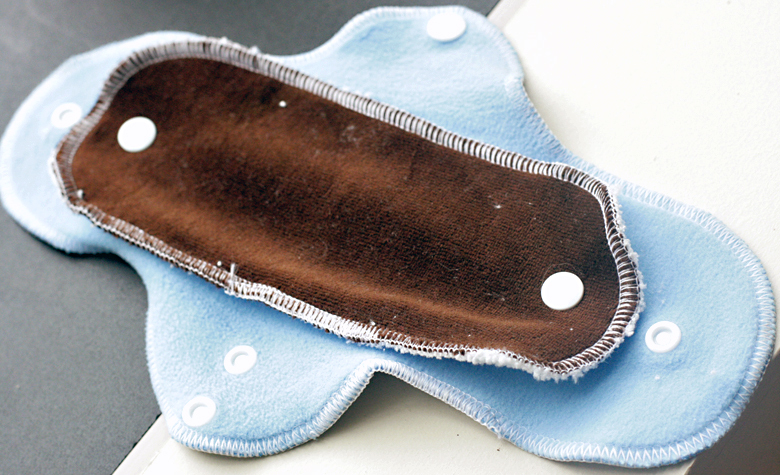 The larger pads are made from microfiber, hemp, and cotton/poly velour (76% combed cotton/24% polyester — the polyester is used on the backside as a stabilizer). 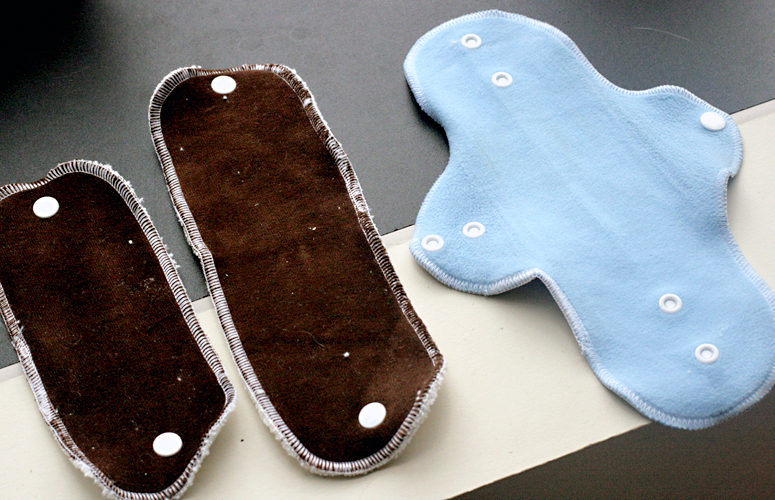 The smaller pads are microfiber and velour. The soft velour sits against the skin, and the workhorse microfiber is highly absorbent. Knickernappies set laid out: small pad, large pad, shell. Everything snaps together, and the wings snap under your undies. A big congratulations to the winners of the SafetyTat Temporary ID Tattoos giveaway — #27 & #61! "These would be amazing for our son when we head over to England this summer. I’ve been wondering what to do for the air travel. These would be perfect." "I would use them on our Grandson on outings. Also his Mom could use them on trips to the store, etc. 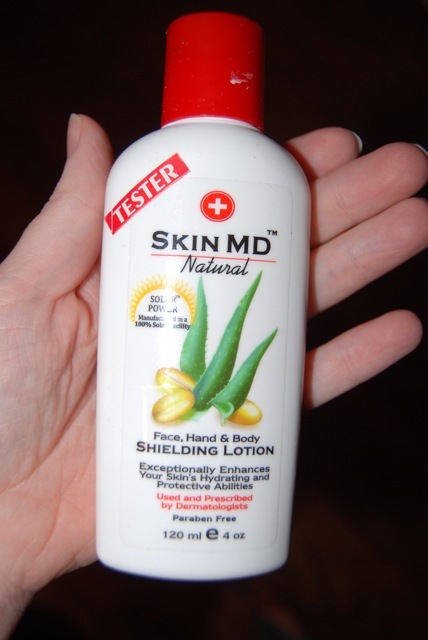 (Just in case...) Great product, wonderful giveaway!!!" This was a joint giveaway with Natural Parents Network, so entries were combined and two winners drawn. Randomly, one winner won from each site. The SafetyTat Quick Stick Write-On! tattoos from SafetyTat temporary tattoos are a sticker-like tattoo on which you can write your phone number. It can be easily applied to your children's arm, and it will stay on for at least 2 weeks — that way, if your children get separated from you (heaven forfend), they don't have to remember or be able to say their phone number; it will be printed right there to be seen by a helpful adult. If you were not the lucky winners, you can purchase SafetyTat temporary tattoos directly from the SafetyTat.com website or from the list of local, online, and international retailers. AND, just for our readers, SafetyTat is offering a coupon code! Get a 10% discount off any order of $15 or more from the SafetyTat website by entering code HoboMama2 (case sensitive). Coupon is good through March 28, so use it now! "I'd like to try Inner Peace. I learned that Herbal Teas are ancient holistic remedies utilized by our ancestress lineage." "I would love to try Mother Earth Zest." "I would love to also try the Inner Peace tea." "Dreamtime sound wonderful to me, I’d love any help I can get to have a restful night sleep." This was a joint giveaway with Natural Parents Network, so entries were combined and four winners drawn. Randomly, two winners won from each site. Morning Blossom is "an invigorating blend of peppermint, spearmint, rose, ginger and alfalfa that encourages motivation and joyful experiences. On the physical level Morning Blossom assists the respiratory system and metaphysically it opens the Heart Chakra to a reciprocal balance of giving and receiving self, romantic and planetary love." SafetyTat temporary tattoos is offering TWO of my readers a giveaway of a sample pack of the SafetyTat Quick Stick Write-On! temporary tattoos (the packet to the left in the picture below). I was intrigued by the benefits SafetyTat tattoos provides when traveling or attending a busy place with your child. The SafetyTat Quick Stick Write-On! tattoos are a temporary sticker-like tattoo on which you can write your phone number. It can be easily applied to your children's arm or hand, and it will stay on for up to 2 weeks — that way, if your children get separated from you (heaven forfend), they don't have to remember or be able to say their phone number; it will be printed right there to be seen by a helpful adult. I envision these being a safety measure for pre-verbal children, or children and others with special needs who might have difficulty recalling or conveying a phone number. You could also write a message about allergies or medical conditions. I'd love to have one of these SafetyTats on Mikko as we were going through an airport, sightseeing in a busy city, or visiting a theme park, children's museum, zoo, or similar crowded attraction. They would be an extra layer of protection before sending your child off on a field trip or camping excursion. It could even make things less stressful during a day of errands or shopping, particularly if you have a child who loves to run off. GladRags is offering my readers a giveaway of a sampler 3-pack of cloth menstrual pads: pantyliner, day pad, and overnight pad! GladRags are made of soft, absorbent cotton and are a reusable, eco-friendly solution to your period. GladRags sent me the same sampler 3-pack for review. 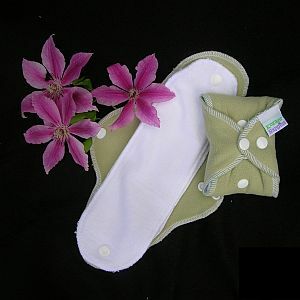 I had been using The DivaCup but disposable pads and pantyliners as backup, and I was eager to try out cloth alternatives. I'm honestly not sure what took me so long. I cloth diapered my son and preferred cloth training pants for him as well — the times we used disposables on trips or in preschool, I had always been struck by how much less comfortable they were, and how they made him more prone to irritation since they were less breathable. But it took me awhile to make the leap to the idea that cloth for myself might be more comfortable, too! $5, $10, & $35 off cloth diapers at Kelly's Closet + FREE one-size diaper! One-Size Cloth Diapers are an excellent cloth diaper choice designed to fit most babies from birth to potty training — very economical! Factory outlet sale on momAgenda day planners & organizers + coupon! Still looking for a functional — and fashionable — way to organize your days? Shop the momAgenda FACTORY OUTLET SALE! While Supplies last, get up to 65% off select agendas, day planners, and other organizing tools!